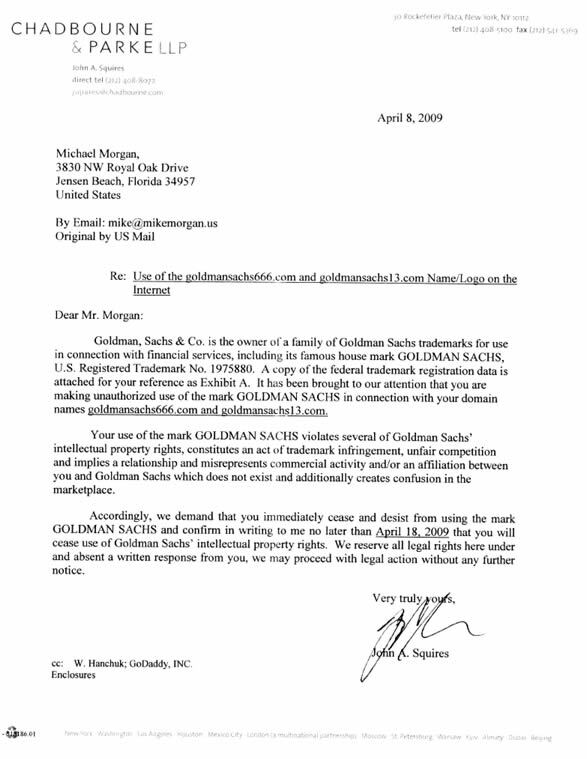 I mean, for sure, it seems to be one of those situations where no one would have ever learned of the sites GODLMANSACHS666.COM and GOLDMANSACHS13.COM, but for the demand letter, but the letter itself doesn’t have the misplaced certitude, the overblown rhetoric, the baseless imputation of evil to the recipient, and over-all lack of self-awareness, that marks the truly dumb demand letter. So I have to disagree with Marco here. I’ve read dumber. But Marco raises interesting points on ‘client control,’ a term that I don’t like, as (1) it is not what our job is; and (2) it can’t be done. We’re in the effective guidance business. We identify options and predict outcomes of selecting those options. BTW, see Lamparello v. Falwell; and Bosley Medical v Kremer. "1-800 SKI VAIL Doesn't Infringe"
This case nicely illustrates that a vanity 800 number containing a third party trademark doesn’t create a likelihood of consumer confusion. To the extent that 800 numbers are analogizable to keyword advertising, this case suggests that maybe keyword trademark triggering doesn’t either. The defendant operates nearly 2 dozen 800-phone lines that all begin “1-800-SKI-[destination].” At issue in this case is the phone line 1-800-SKI-VAIL. The 800 number was a redirection service that routed callers to various businesses such as travel agencies. Edison-based I-many, Inc. (NASDAQ:IMNY) announced that it has filed a lawsuit against Model N, Inc. of Redwood Shores, Calif., for trademark infringement, dilution, fraudulent business practices and unfair competition. The Edison provider of contract management software and services alleges that Model N has deliberately used I-many’s registered trademarks in a series of online advertisements, where potential customers who click on the trademark “I-many” are diverted to Model N’s Web site. "Keyword Ads and Metatags Don't Confuse Consumers"
Audi AG v. D’Amato dba Quattro Enthusiasts (05-2359) (6th Cir Nov 27, 2006) (AUDISPORT.COM infringes and dilutes AUDI). Filed under: Initial Interest Confusion, Likelihood of Confusion, What Is This Thing Called Dilution? "Germany: Trademarks As Meta Tags"
From Lovells September 2006 newsletter: “Germany: Trademarks As Meta Tags” (discussion of German Supreme Court decision re whetherunauthorized use of a trademark as a meta tag constitutes infringement in Germany (yes)). Prof Goldman expresses mystification about a recent metatag decision. I apologize for not reporting on this case earlier. Defendants were a not for profit organization (“NFP”) helping restaurant workers, and a restaurant owned by a workers’ cooperative, in which the NFP had a 40% interest. The NFP protested Plaintiff’s policies relating to its workers. The NFP created a hand-out that reproduced the Plaintiff’s logo on the cover (the hand-out was folded). When opened, the text of the hand-out contained information about the organization’s criticism of Plaintiff (the brochure identifies the NFP as the source and promoted the NFP’s primary mission of helping restaurant workers – and makes no mention of the co-op restaurant). A reproduction of the leaflet is here. The hand-out was distributed near Plaintiff’s establishment. Defendant acknowledged that the appearance was intended to induce passers-by to accept the leaflet and read it. Plaintiff sued on trademark infringement and dilution. The Court denied the motion for preliminary injunction because plaintiff was unable to show irreparable harm; however the Court found that the plaintiff WAS likely to prevail on infringement, having shown a likelihood of confusion, basing its decision that defendant’s use of the tradeamark initially confused passers-by and diverted them to use defendant’s services, namely educating them in its viewpoint. Prof. Goldman, in discussing this case, refers to it as a travesty and one of the five all time worst initial interest confusion cases of all time (I will be emailing him to obtain the complete list). SMJ Group. et. al. v. 417 Lafayette Restaurant LLP, 06 CIV 1774 (SDNY July 6, 2006). HT Prof Goldman, who provides other links to law review articles on the same topic. Technology & Marketing Law Blog: Metatags as Per Se Trademark Infringement. Tdata Inc. v. Aircraft Technical Publishers, 2006 WL 181991 (S.D. Ohio Jan. 23, 2006).